The traditional form for these has long been like a pair of barber's hair clippers – and, indeed, most of these can be used to trim your head hair to a Statham-esque stubble, or tame unruly body fuzz. However, there are now a few outliers that take a more innovative approach to beard management. So If you're looking for regular beard management or the occasional trim, what is the best beard trimmer/shaper? These ones are the sharpest, to put it bluntly. As with electric toothbrushes, never pay full price for a beard trimmer; they are bloody always on sale. Always. When considering a beard trimmer there are several things to consider. 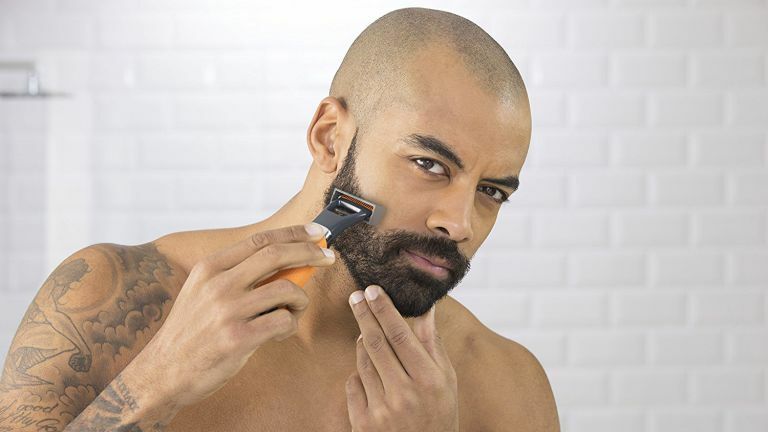 The first one is length: some trimmers are only suitable for short beards, while others come with a range of heads or guards that can be used for bushy beards. Most trimmers can be used for body hair and the hair on the top of your head too, but if you want anything other than a skinhead, you'll again want a trimmer that's capable of longer length settings. Charge time may matter if you’re constantly on the move, and often these things take 8 hours or more to fully juice up. Realistically, that shouldn't be a problem if you only trim once per day, but if you suffer from beard maintenance anxiety, you might favour a trimmer with an emergency 'quick charge' feature, giving a full trim after just a few minutes charging. Watch out for consumables – while many trimmers have self-sharpening blades that last forever, some need oiling, and some even require regular replacement. As with electric toothbrushes, our biggest tip is : never pay the RRP on higher-end beard trimmers: grooming gadgets are regularly discounted, as reflected in our handy pricing widgets. -Only for the shorter beard-What is that laser for? • Apologies if our pricing widgets are showing you a crazily high price for this device, this is due to technical issues. It should cost well under £100, as at John Lewis. I have had one of these for 5 years and used it – usually in the shower – multiple times per week. And yes, admittedly the battery did eventually die (it now only works when the power cable is plugged in, although that in itself is a feature that some trimmers lack), but I can't really fault it for the price. The headline feature here is an actual laser, which projects onto your face so you can cut extra straight lines in your beard. Needless to say, this is utterly useless, so let's ignore that and press on to the non-headline features. For shorter beards (up to 7mm), there's nothing to beat the 9000 Series. It goes through even wiry neck hair with ease, edges neatly, yet there's never any danger of being cut or suffering irritation. That's despite the fact that you never ever need to oil it or replace the self-sharpening blades. Because it's 100% waterproof you can use it in the shower and it's very easy to clean. Bottom line: because Philips wanted this to have a premium feel, they put a laser in it. But the good news for beardies is that they also made it as good as a beard trimmer could be. The only bum note is that if you have a beard longer than 7mm, you can't use this, unless you 3D print a longer comb attachment or something. We were a bit skeptical of this Panasonic trimmer at first, as it's unlike any trimmer we've used before, but after getting used to it (that does take some time) it's quickly become one of our favorite grooming tools. Why is it so difficult to get used to? As you can see from the image, you don't hold it like a traditional trimmer, as the cutting blades are in-line, rather than perpendicular, to the handle. This results in a lot more visibility while trimming, making it easier to create clean edges to your stubble. This is also aided by the long and sharp cutting blades. If you're after more precision, the Panasonic comes with a detail attachment, which essentially covers 2/3s of the blade, and makes getting to those hard to reach places easier. As well as the detail attachment, you'll also get an adjustable comb with 20 cutting lengths from 0.5 - 10 mm. This makes getting your stubble the perfect length a breeze. Unlike the Philips above, however, you do need to oil and replace the blades. Panasonic suggests oiling after every use, which is a bit of a hassle. It's also has quite a plasticky quality but then, to be fair, they all do. The Philips OneBlade is an odd-looking thing, with what appears to be a large Mach 3-style blade instead of the familiar cutting comb (although with the Pro models you get a cutting comb too). The main selling point here is the absence of razor burn: if you’ve found other trimmers leave your face a fiery red, you will find the OneBlade considerably more gentle. You'll want to stand near the sink, use it in the shower, or keep a cordless vac nearby, mind: the way the head vibrates sends cut stubble all over the place. The dual-sided blade is designed to cut more precisely than a comb and we find they last about 6 weeks to 3 months before needing to be replaced. That's somewhat less than Philips' claim of 4 months, but the replacement heads aren't especially pricey or hard to find. The battery runs for 90 minutes on a one-hour charge and it can handle beards up to 10mm via its adjustable comb head. I'd say it is suited to shorter trims on the whole – it's most ideal for those who favour neither beards nor a smooth visage: it does perma-stubble brilliantly. There are a number of versions of the OneBlade available at Amazon and elsewhere, and particularly if you suffer from facial irritation, they are all excellent. The hardware of the non-'Pro' versions does have more of a tendency to wear out, however. That's because rather than having an integral, adjustable comb for different lengths, they use interchangeable combs. We’re big fans of Braun shavers, clippers and trimmers: they’re rock solid, last forever and do the job without any fuss, and they tend to be pretty cheap too. If you’re looking for a good all-rounder to keep your beard looking its best, the BT3040 is well worth a look: with two combs and precision length settings you get 39 different lengths to play with, from five o’clock shadow to a luxuriantly long 21mm. That means it can double as a hair clipper too, and Braun also bundles a Gillette Fusion ProGlide for precision edging. It’s not the fastest to charge - it takes about eight hours to charge from flat, and needs charging again after an hour - but it’s an excellent all-rounder. As much as we hate the fashion for adding an “i” prefix to make things sound modern, the iStubble is a smart shaver indeed: its trimmer guard is motorised, enabling you to set the length perfectly. You can expect around 45 minutes use from 90 minutes of charging, and if you forget to charge it completely there’s enough power for a single shave after just five minutes - although a full charge does take 16 hours. It’s not suitable for Santa or hipsters - the maximum cutting length is 5mm - but if you prefer your beard to be short then the iStubble is one of the best shavers to keep it that way. We used to carpool for work, and one of our colleagues would jump in the passenger seat of our car and immediately fire up his electric shaver - something we weren’t happy about until we realised he was leaving his DNA everywhere and framed him for a series of murders. If only he’d bought the Philips, which has an integrated vacuum system to catch most of the facial fallout. It promises to catch 90% of your cuttings (albeit in lab conditions), so that should mean less cleaning up after each cut. In my experience, you still need to clean up after, just as you do with any other beard trimmer. In fact, I'd even go so far as to say that, as with its 'laser-guided' trimmer, Philips has again come up with a trimmer whose 'bonus feature' is a pure gimmick to catch your attention. On the other hand, also like the laser-trim-o-matic, this is an excellent beard tamer, so long as you aren't too fussed about its headline feature. The lockable cutter has 20 settings from 0.5mm to 10mm and you’ll get around an hour of shaving from a single charge. Also as with the laser one, don’t pay the RRP as it’s frequently available for much less. Rechargeable batteries are all well and good, but most of us have been caught out by the battery trap: you’re halfway through a trim or a tidy-up and the battery’s flat, often catching hairs in the blades as the trimmer dies - and sod’s law means it happens when you’re in a hurry to meet someone or get to work and don’t have time to wait for your cutter to recharge. Wahl feels your pain, and it’s come up with a charging system that delivers enough power for a trim in just one minute. The Grooming Station comes with four heads and seven combs enabling you to trim to up to 12mm and to trim close-cropped hair on your scalp too. The Remington Durablade is another favourite grooming tool of ours. It's a hybrid trimmer and shaver, which has both positive and negative points. The Durable is capable of a closer shave than many of the trimmers on this list, it's lightweight, and you never need to replace the blades. But, while it does undaboutable offer a closer shave, it's not as good as a traditional electric shaver, and it's not as powerful as other trimmers on this list. It's a classic jack of all trades, master of none. That being said, it's an incredibly useful little tool to take away one holidays or when travelling for business, and great for quick touch up jobs, when time is off the essence.